Maria Roosen was born in Oisterwijk, The Netherlands, in 1957. She currently lives and works in Arnhem, The Netherlands. She graduated from the Arnhem Academy of Art and Design in 1983. Roosen’s art encompasses watercolours, objects, and installations. Amongst her favourite materials for installations are glass, ceramics, textiles, and natural elements like wood and trees. To produce her works, she focuses on the execution process, on the interaction between objects, human manipulation, and creativity like, for example, blowing glass into a pair of sandals or around a tree. In this way, not everything can be conceptualized beforehand; the materials can react in unexpected ways and unforeseen shapes can happen that become part of the artwork itself. 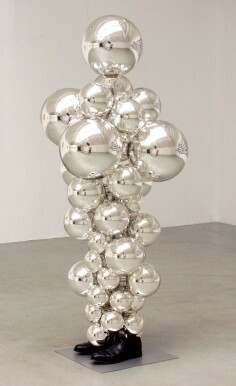 Roosen has participated in major international exhibitions at such prominent museums and galleries as the Kunsthal, Rotterdam; Nationaal Glasmuseum, Leerdam; 21_21 Design Sight, Tokyo; Groninger Museum, Groningen; Glazen Huis, Lommel; Museum Kunst Palast, Dusseldorf; and Galerie Fons Welters, Amsterdam. Her works can be found in prestigious collections at the Groninger Museum, AKZO Nobel Art Foundation, and Museum Moderne Kunst, Belgium; Museum Boymans van Beuningen, Rotterdam; and Museum voor Moderne Kunst, Arnhem. Maria Roosen calls herself “an artist with green fingers”—fittingly, her sculptures and installations feature imagery that references both plant and human organs, often in conjunction. Though her practice incorporates wool, wood, and sometimes watercolor, Roosen is best known for her ability to manipulate hand-blown glass. She creates a playful irony in the contrast between the material’s hardness and the fluidity and voluptuousness of the shapes she creates with it. Roosen refers to her practice as an exploration of “that which is impossible of reality,” conjoining contrary, exaggerated forms as in her iconic works Breastberries (2009) and Curtain (2010). Maria Roosen (born 1957 in Oisterwijk, the Netherlands) makes images, drawings, watercolours and installations in a range of materials, including glass, wool, wood and gold leaf. Roosen’s work can be seen as a plea for our fact-packed, practically-minded world to have some imagination. Roosen is fascinated with the processes of growth, creation and coming into being, and accordingly there are recurring themes in her work such as fertility and growth potential. With Roosen, objects take on a corporeal appearance — a certain sensuality — through the use of flowing curves.